Enso neutral conditions have prevailed subsequent to the last 2016-17 La Nina event that ended at the end of January 2017 (NDJ 2017). Last five ONI Index are ASO 2017 -0.4ºC, SON 2017 -0.7ºC, OND 2017 -0.9ºC, NDJ 2018 -1.0ºC and DJF 2018 -0.9ºC. Now four 3-monthly seasonal ONI Index are in the La Nina zone so an official La Nina event is expected at the end of March 2018. 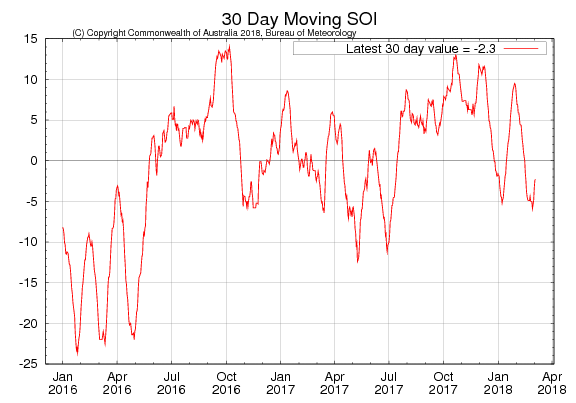 The 30-day Southern Oscillation Index (SOI) to 5th March 2018 is −2.3, which is within the neutral range. 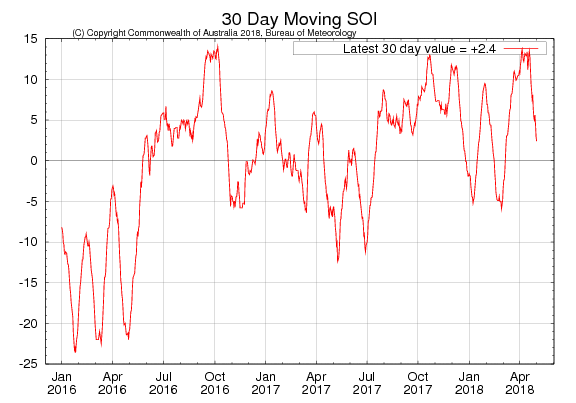 While the SOI fluctuates more during the southern hemisphere summer due to movement of tropical systems, it has spent most of 2018 to date within the neutral range. SOI Monthly graph up to February 2018 as per The Long Paddock – Queensland Government. 30 Days average SOI was -6.91 at the end of February 2018 and -2.84 on 6th March 2018 as per The Long Paddock – Queensland Government and 90 Days average SOI was -0.35. All international climate models surveyed by the Bureau indicate that the current event is likely near its end. Four of the eight surveyed models maintain values close to La Niña thresholds for March, but all models indicate equatorial Pacific sea surface temperatures are likely to continue to warm over the coming months. Only one model anticipates NINO3.4 will meet La Niña thresholds for May, and all models predict ENSO will be in a neutral phase during the southern hemisphere winter. In order to consider 2017–18 a La Niña year, NINO3 or NINO3.4 values cooler than −0.8 °C need to be observed for at least three months. 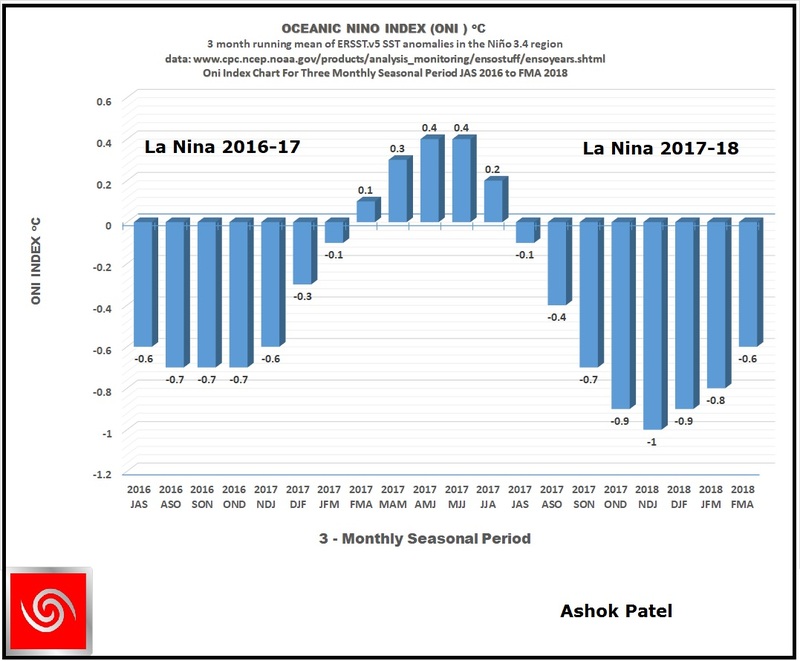 Using NOAA Criteria A Full Fledged La Nina is expected to be declared at the End Of March 2018. The current SST February 2018 of Nino 3.4 region is at -0.87°C and so now last four ONI Index have La Nina thresh hold as SON 2017 at -0.7°C, OND 2017 at -0.9°C, NDJ 2018 at -1.0°C and DJF 2018 at -0.9°C and so Enso Neutral conditions prevails. 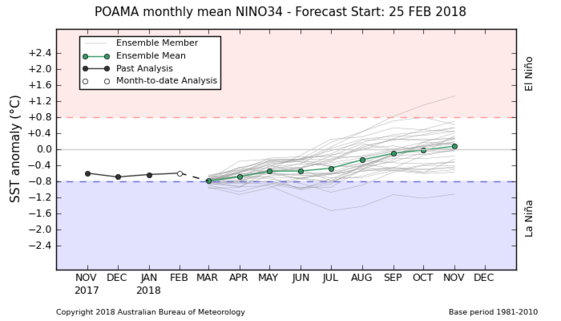 Potential La Nina event is expected to commence at the end of March 2018 since the next 3-monthly season namely JFM 2018 is very likely to remain equal to or below -0.5°C. Thereby a 2017-18 La Nina event is expected to commence at the end of 2018 March as per NOAA criteria. Similarly also surprising to see that NOAA CPC/NCEP update of 5th March says “A transition from La Niña to ENSO-neutral is most likely during the Northern Hemisphere spring (~55% chance of ENSO-neutral during the March-May season)”. NOAA’s contention is indeed strange. 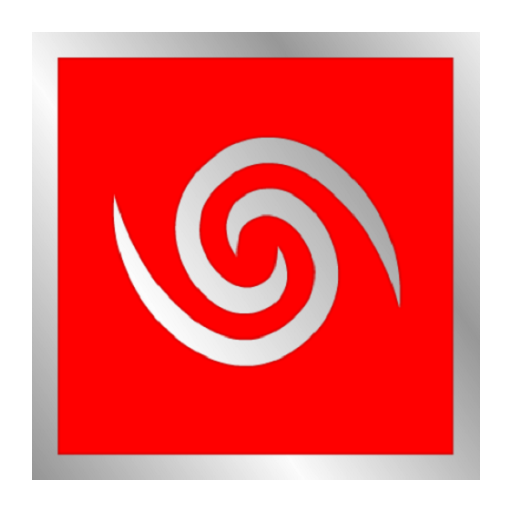 How can there be a transition from La Nina to ENSO-neutral when the La Nina event has not yet been declared officially? At least end of March 2018 is not expected to be in ENSO neutral zone. NOAA માપદંડ મુજબ વિધિવત La Nina 2018 માર્ચ આખર સુધી મા શક્ય. છેલ્લા 4 ત્રી-માસિક સીઝન માં ONI ઈન્ડેક્સ -0.5°C અથવા તેનાથી નીચે રહેલ છે, જેમ કે SON 2017 at -0.7°C, OND 2017 at -0.9°C, NDJ 2018 at -1.0°C and DJF 2018 at -0.9°C. તેમજ પાંચમું ONI ઈન્ડેક્સ -0.5°C અથવા તેનાથી નીચે રહેવાની પુરે પુરી શક્યતા છે. 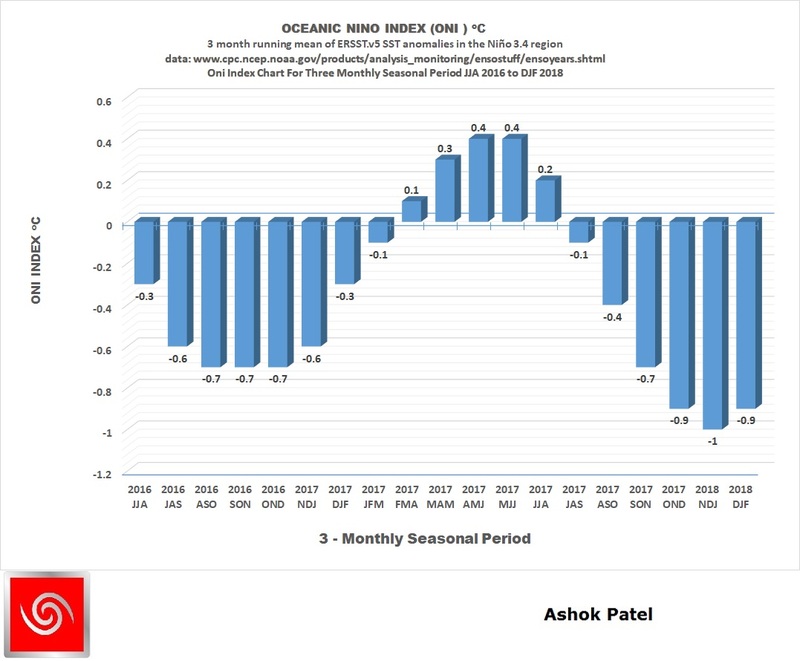 એટલે NOAA માપદંડ મુજબ વિધિવત La Nina 2018 માર્ચ આખરે ડિક્લેર થવાની પુરી શક્યતા છે. મારુ માનવું છે કે માર્ચ 2018 સુધી માં La Nina થશે અને ENSO ન્યુટ્રલ પરિસ્થિતિ શક્યતા નથી.